You don’t need to settle for chain-link fence and some patio slabs just because your yard is small. 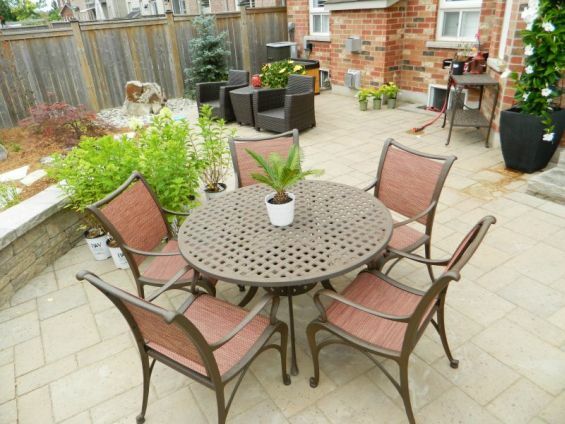 There are lots of great landscaping ideas for small yards to maximize your space. First, review your “must-have” list. If your list is extensive, you may need to pare it down or consider multiple use items like storage within an outdoor bench or a retaining wall that doubles as extra seating. Consider carefully before adding a gazebo or pergola to your “must-have” list – these structures not only require clearance and possibly a tricky permit, but the supporting posts may end up in your sight line creating an obstructed view of your outdoor space from the inside of your home. Instead, consider water features such as bubbling rocks which provide aesthetic focal points and draw attention away from the size of the space. A small garden can be beautiful. Layer plants of different sizes, colours and shapes that flower at different times of the year. Add extra colour with the use of pots, but don’t over plant – plants will increase in size over time and you may end up with the “overgrown” look. Consider dwarf plants where possible – they are available in shrubs, perennials, evergreens and conifers. In densely populated areas, privacy is an important consideration. A cedar fence as high as building code will allow will create your own private oasis away from nosy neighbours. Don’t despair, even small yards, can be a relaxing retreat!